I love having friends around for dinner. A long chat, lots of laughter, a nice glass of wine and music are good for the soul. That's why I don't particularly like making ellaborate meals for a casual dinner get-together. Who wants to sweat in the kitchen while everyone is having a good time. My favourite types of dinners are our cheese and wine evenings. Everyone brings their favourite cheeses, we have freshly baked baguettes, cold meats and various snacky bits. The other day we spontaneously had our friends Dan and Cat over. We drank two bottles of the bestest reds went through numerous chunks of cheese, a loaf of crusty bread and a plate of stuffed charred peppers. Those evenings are the best, when you stay up too late on a school night and wonder how you'll get up in the morning but you've just made another memorable evening spent with people you love and conversations to remember. 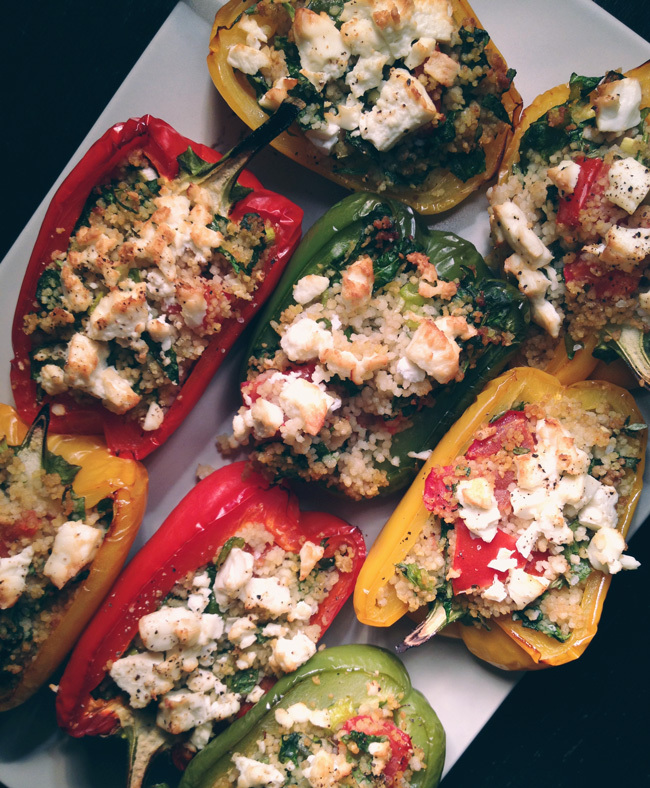 These stuffed peppers are sooo easy to make and would taste even better prepared on the barbecue. But the old oven and grill will do. Pre-heat the oven to 190˚C and (if you have a seperate one) the grill to full wack. Once the oven is hot, place the peppers onto a baking tray, skin side up. Bake for about 20 minutes or until the skin starts to char and the peppers are cooked. While the peppers are cooking, place the couscous in a heat proof bow with a little salt and, just, cover with boiling water. Cover with a plate and leave to sit for five minutes, until the couscous has absorbed all the water. In another bowl mix the spinach, garlic, chilli, oregano and about one tablespoon of olive oil. Mix the cooked couscous with the veggies. Add the balsamico and season with salt and pepper. If it's too dry add a little more olive oil. 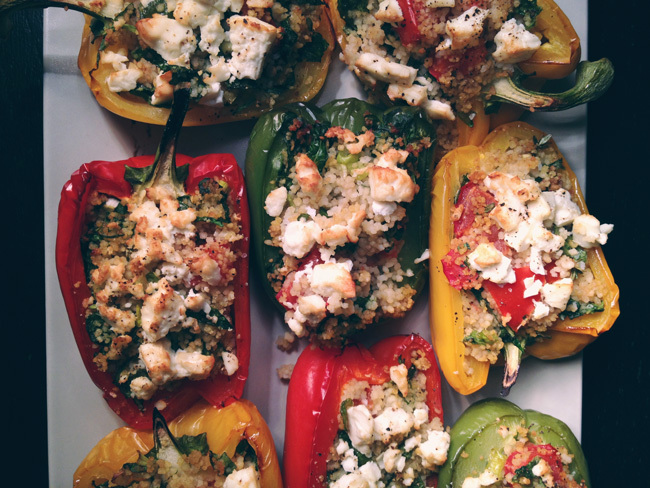 When the peppers are cooked, turn them around and fill with the couscous mixture. Crumble the feta on top and place under the grill for 5-10 minutes, or until the feta starts to brown and soften a little. I love these kinds of evenings! When I have people over, I usually prepare the meal beforehand so I can spend most of the time with them. I didn't used to do that, but it feels way better!